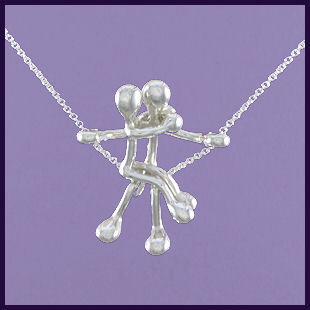 Lovers on a Swing is a wonderful and unusual solid Sterling Silver Pendant of a couple matchstick figures one sitting on the others knee while playing on the swing this comes on an Italian 925 Sterling Silver Chain . The pendant is 34mm high, 29mm wide, 22mm deep and is 9g approx in weight. You can choose between different chain lengths.